Last weekend I attended a Barista training course at Laynes Espresso to learn a little more about coffee. Learnt the basics such as where coffee comes from, the different varieties, how to make good cup of coffee and how to look after your coffee machine. This was not an exclusive course that only ran last weekend and only available to a select few, in fact Laynes offer a range of training to all who are interested, such course include: barista training (that I attended), latte art training, coffee at home training (next on my list) and commercial training. The sessions are run in small numbers, with only 3 in my class (including me) and lasts around 2 to 3 hours. There's discount to be had if two of you are booking on the class so grab a coffee enthusiastic friend and sign yourselves up. The training started by introducing us to where coffee comes from, something I had never really thought about it too much. 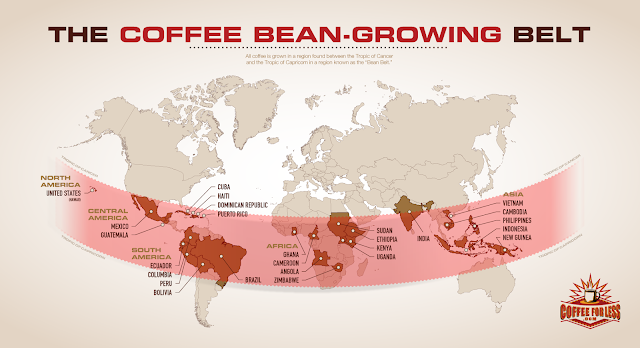 I knew that coffee was made from coffee beans that coffee grows in tropical climates but beyond that was a mystery. Coffee beans are found in coffee cherries, yep that's right cherries. The beans are extracted from the cherries either by hand (extremely time consuming) or by using machines. The leftover cherry pulp has for many years been discarded aside and used for fertiliser later. In an attempt to produce less waste and increase the profitability of the coffee farmers this pulp is now collected in small quantities to offer an alternative type of coffee. So where is coffee grown? Can I grow it in my garden in sunny Yorkshire? No, sorry I'm afraid not. You could try but I doubt it would taste very nice. There is such a thing as a coffee belt, a bit like the rhubarb triangle but on a much (MUCH) larger scale. Each country's coffee has a distinct taste, coffee grown at low altitudes (some below sea level) have a really earthy (and often described as dirty) taste, whereas coffee grown at high altitudes is much fresher and more palatable. Australia is the baby of the coffee world as they have just started growing coffee and I'm told their crops are currently hit and miss year on year. (Perhaps not worth investing in an Australian coffee farm just yet). There are two main 'species' of coffee, coffee arabica and coffee robusta. Robusta is generally what you will find in commercial coffee shop chains and on supermarket shelves. It's much stronger in taste than arabica and contains more caffeine. It's often described as having a burnt taste and all that extra caffeine makes it taste bitter too. Arabica on the other hand contains less caffeine so has a less bitter taste and a much more pleasant and complex taste. Laynes only use arabica beans. To show us the differences between arabica and robusta coffee beans we took part in a coffee cupping exercise. Jim, who was running the training, first ground the arabica beans (Kabingara and Nyawira) we gave them a bit of a sniff and they both smelt amazing. I've mentioned previously how freshly ground coffee is fast becoming my number one smell, these two blends were so luscious I almost wanted to lick it out of the cup (this is not advisable). Then the robusta was ground (Rossa) which you'll find in most supermarkets and it smelt horrible! It had a dirty dusty smell and it really didn't inspire me to drink it. With the beans ground Jim fetched some hot water and poured it directly on to the ground coffee and left it to brew for around four minutes. Crema (what I would call 'scum' but as crema is a much more pleasant term I'll use that instead) gathered at the top and this was scooped away. We were given cupping spoons which look a little like soup spoons with a deeper indent to really 'scoop' up the coffee. We were then taught how to properly taste the coffee by slurping from the spoon whilst breathing through your nose and then swishing it around your mouth. A bit like wine tasting, and you can spit it out too but none of us decided to do this. There was a clear difference between the arabica and the robusta, the robusta wasn't pleasant at all. In addition to this Jim also brewed us a cup of dried coffee cherries, this tasted more like a sweet fruity tea than coffee and I quite enjoyed it. This way of trying the coffee is completely new to me, I've only ever had espresso or instant coffee. It wasn't as thick as espresso but much more watery and much less intense in taste. Next on the lesson schedule was teaching us to use an espresso machine. I'm still surprised they let us loose on their beloved machine as it cost them £12K! The grinder alone cost £3K. That is some investment. The espresso machine was all singing all dancing. The whole process was surprisingly precise, such as the weight of the coffee once ground, the amount of time it takes to be filtered through the water, the weight once liquid. So many variables can affect timing and taste too, such as heat, humidity and the water which is used. That's why every morning the guys in Laynes get in early and work out the settings needed for that day. These guys are amazingly committed. The espresso blends are a range of coffee beans that are mixed to let specific flavours combine and shine through. Laynes have a lot of their own tailored blends which they themselves have chosen. There could be three different types of beans from three different parts of the world making up your one little espresso. We were taught how to adjust the grind of the beans to either speed up or slow down the brewing process. We tried the espresso at varying different stages when it wasn't quite right so that we could learn when it tasted at it's best. The importance of keeping the equipment clean was really drilled in to us. The greases from the coffee beans if left in the machine can muddy the taste so it's important to keep washing and drying the equipment. We were told that you should only roast to order and not leave ground coffee sat around or filtered coffee (or coffee poo as I like to call it) in the machine. Jim talked us through the differences between cappuccinos, lattes and flat whites, with cappuccino being made with the most amount of milk to a flat white the least. A piccolo uses even less. If you're not quite at espresso drinking stage (like me) milk will take away some of the sourness of the coffee, if you want to wean yourself off the milk start by drinking a flat white or piccolo which allows you to get more of that coffee taste. When I tried the cappuccino I could barely taste the coffee. We had a brief lesson on how to steam milk, apparently it's bad to have bubbles or frothy milk as this is distorting the taste of the coffee. Burnt milk will also taste sour and smell like baby sick... nice. Laynes keep their milk as fresh as possible by always keeping it in the fridge and not left out on the side. As I don't have a milk steamer such as the one attached to Laynes' espresso machine I was advised to only heat my milk to 55 to 60 degrees and to use a thermometer to do so, only gently using a milk frother afterwards. I quizzed Jim on pod coffee machines and he said he had a certain level of respect for them as they used fresh coffee and was much better than some other home coffee methods. The following weekend I decided to use my new found coffee knowledge with the Tassimo coffee machine. The Tassimo Joy was sent to me to try out and to help with my coffee discoveries. It promises barista style coffee at the touch of a button. Tassimo coffee machines aim to take out all of the complex brewing methods and make it easy for the home coffee drinker by carefully measuring the correct amount of water, brewing at specific time and at the right temperature. You don't have to tap in to the machine which coffee pod you're inserting as it automatically scans the barcode on the pod and calculates the correct water, temperature and timings. Clever. In addition to this the Tassimo joy has a brita filter in the water tank to take out the impurities that can distort the taste of coffee. The first time I set up my Tassimo I had to ensure that it was cleaned thoroughly, something which Jim also endorsed in our barista training. The instructions came in pictures rather than a wordy description, I guess this makes it universally understandable if they are shipping them world wide. I missed the word descriptions as I usually repeat these aloud to myself whilst in the process of acting them out, be it setting up a coffee machine or putting together a wardrobe (put woody widget in to left top holey 5 downer - the neighbours must think I'm crazy). Saying this my housemate still shouted from the living room if I was talking to her or myself... seems even picture instructions make me talk aloud to myself. I was excited to try out my first coffee (and so too was my housemate K). First up was the Kenco Caffe Crema. Each pack advises on the correct cup size (in ml) for the pod. If you're unsure and are worried that your coffee will spill over simply pour some water in your cup and then pour in to a measuring jug to check. I popped in my pod, placed my cup underneath, pressed the button and excitedly waited to see what happened next. A few spurts and steam came out... no coffee. Confusion swept over me for 10 seconds until it finally started brewing the coffee in to the cup. Within a minute or so the coffee was ready. I couldn't believe how simple it was, but how did it taste? The caffe crema is essentially a black coffee with a velvety top. I tried it 'naked' and it was very rich, I had to add some milk. This took our the sourness of the coffee for me and compounded down some of the intensity. I made two more cups for my housemates. With Jim's lessons firmly in mind I made sure that the blank pod was placed in the coffee machine after each cup and the coffee machine washed through with hot water to remove any residual coffee grease or grind which might later distort my future coffee's taste. After a rather strenuous yoga session (if you don't believe me you haven't met my yoga teacher) I came home and decided to try the Carte Noire Latte Macchiato Caramel. Again, I was presented with picture instructions and within this pack there are two pods. The two pods were a caramel latte pod and an espresso pod. I would have assumed the espresso would be the first pod to brew and this probably explains why I stared at the instructions for so long, as the instructions appeared to be telling me to inset the latte (milk) pod to go in the machine first. Once both pods had been inserted, as you can see, it left a layered look. Very pretty but I was unsure this would blend all the flavours together properly. With no notes to do anything about this I took out my frother and gave it a quick stir, making sure to not over froth as advised by Jim. This coffee was incredibly sweet, it was almost like drinking a cup of hot caramel. Perhaps one I'll save for when I'm craving something sweet but don't want to overindulge. I made the same coffee again the next day for D, he tried it pre-frother and got a mouthful of espresso, not being a keen coffee drinker he wasn't impressed. Post frother D was immensely impressed, he didn't find it too sweet at all. I think I'll be saving this one for D.
Later on that day I was starting to feel a coffee come down after I had napped. I tried the Kenco pure Colombian pod, it's made from arabica beans (tick!) and is described as a fruity blend. I found this pod to be incredibly strong and quite bitter. I heated up some milk and as advised by Jim I made sure my thermometer was present and then added it to the coffee. The Tassimo doesn't just make coffee, there are also pods for hot chocolate and tea! Unfortunately I didn't have any tea pods but I did have some hot chocolate pods and some espresso pods (the same pods which come with the caramel macchiato), when placed next to each other it sparked an idea... I wondered if I could mix the two and create a mocha? As with the macchiato I used the espresso pod second and brewed the hot chocolate first. Once again learning from my previous experience with the machiaccto I decided to give it a whizz with the frother to mix together the coffee and chocolate. I could barely taste the coffee, perhaps I'm growing a coffee taste tolerance, I could taste the chocolate however and lapped it down. The coffee was most definitely present as it gave me the caffeine boost I needed not to nap at 6pm on a Sunday evening. The Tassimo is a great machine if you don't have time to faff around with stove tops, aero-presses and the like. You can simply pop the pod in and get on with something else whilst it makes your coffee to the pre-programmed specifications. The Tassimo will be a great little device for me on a weekday morning where I literally walk around the house like a zombie not really knowing what I'm doing. I've had a look in the local supermarkets and there are a plentiful supply of pods on offer for around £4 to £5, working out at less than £1 a cup. There are further selections available on the Tassimo website, the Chai Latte particularly sparking my interest. The limitations of the Tassimo are clear, the coffee beans are limited to the pods that Tassimo sell. I'm enjoying trying different blends with my stove top so I don't think this will replace my stove top which I will continue to use on a weekend when I have more time to potter around and faff with coffee. It's also hard to tell when the coffee beans have been roasted prior to them being placed in the pods, however I suspect the vacuum packed pods sealed with a foil top keep it relatively fresh and they have best before dates. 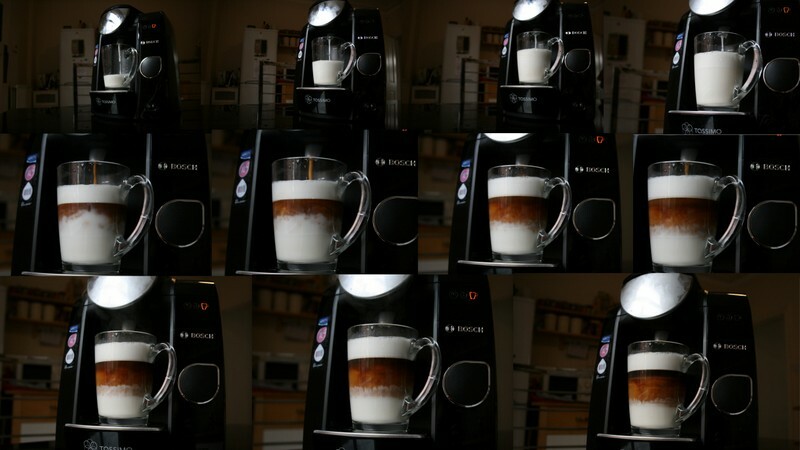 The Tassimo in action creating a Latte Macchiato Caramel (complete with coffee sound track). If your browser won't let you see the embedded video click here. Sound perfect for you? You can buy one here.